describe the challenges that information technology brings to individual privacy. Information systems have had an impact far beyond the world of business. New technologies create new situations that we have never dealt with before. How do we handle the new capabilities that these devices empower us with? What new laws are going to be needed to protect us from ourselves? This chapter will kick off with a discussion of the impact of information systems on how we behave (ethics). This will be followed with the new legal structures being put in place, with a focus on intellectual property and privacy. The term ethics is defined as “a set of moral principles” or “the principles of conduct governing an individual or a group.” Since the dawn of civilization, the study of ethics and their impact has fascinated mankind. But what do ethics have to do with information systems? The introduction of new technology can have a profound effect on human behavior. New technologies give us capabilities that we did not have before, which in turn create environments and situations that have not been specifically addressed in ethical terms. Those who master new technologies gain new power; those who cannot or do not master them may lose power. In 1913, Henry Ford implemented the first moving assembly line to create his Model T cars. While this was a great step forward technologically (and economically), the assembly line reduced the value of human beings in the production process. The development of the atomic bomb concentrated unimaginable power in the hands of one government, who then had to wrestle with the decision to use it. Today’s digital technologies have created new categories of ethical dilemmas. For example, the ability to anonymously make perfect copies of digital music has tempted many music fans to download copyrighted music for their own use without making payment to the music’s owner. Many of those who would never have walked into a music store and stolen a CD find themselves with dozens of illegally downloaded albums. Digital technologies have given us the ability to aggregate information from multiple sources to create profiles of people. What would have taken weeks of work in the past can now be done in seconds, allowing private organizations and governments to know more about individuals than at any time in history. This information has value, but also chips away at the privacy of consumers and citizens. One method for navigating new ethical waters is a code of ethics. A code of ethics is a document that outlines a set of acceptable behaviors for a professional or social group; generally, it is agreed to by all members of the group. The document details different actions that are considered appropriate and inappropriate. No one should enter or use another’s computer system, software, or data files without permission. One must always have appropriate approval before using system resources, including communication ports, file space, other system peripherals, and computer time. Designing or implementing systems that deliberately or inadvertently demean individuals or groups is ethically unacceptable. One of the major advantages of creating a code of ethics is that it clarifies the acceptable standards of behavior for a professional group. The varied backgrounds and experiences of the members of a group lead to a variety of ideas regarding what is acceptable behavior. While to many the guidelines may seem obvious, having these items detailed provides clarity and consistency. Explicitly stating standards communicates the common guidelines to everyone in a clear manner. Having a code of ethics can also have some drawbacks. First of all, a code of ethics does not have legal authority; in other words, breaking a code of ethics is not a crime in itself. So what happens if someone violates one of the guidelines? Many codes of ethics include a section that describes how such situations will be handled. In many cases, repeated violations of the code result in expulsion from the group. In the case of ACM: “Adherence of professionals to a code of ethics is largely a voluntary matter. However, if a member does not follow this code by engaging in gross misconduct, membership in ACM may be terminated.” Expulsion from ACM may not have much of an impact on many individuals, since membership in ACM is usually not a requirement for employment. However, expulsion from other organizations, such as a state bar organization or medical board, could carry a huge impact. Another possible disadvantage of a code of ethics is that there is always a chance that important issues will arise that are not specifically addressed in the code. Technology is quickly changing, and a code of ethics might not be updated often enough to keep up with all of the changes. A good code of ethics, however, is written in a broad enough fashion that it can address the ethical issues of potential changes to technology while the organization behind the code makes revisions. Finally, a code of ethics could have also be a disadvantage in that it may not entirely reflect the ethics or morals of every member of the group. Organizations with a diverse membership may have internal conflicts as to what is acceptable behavior. For example, there may be a difference of opinion on the consumption of alcoholic beverages at company events. In such cases, the organization must make a choice about the importance of addressing a specific behavior in the code. Many organizations that provide technology services to a group of constituents or the public require agreement to an acceptable use policy (AUP) before those services can be accessed. Similar to a code of ethics, this policy outlines what is allowed and what is not allowed while someone is using the organization’s services. An everyday example of this is the terms of service that must be agreed to before using the public Wi-Fi at Starbucks, McDonald’s, or even a university. Here is an example of an acceptable use policy from Virginia Tech. “Borrowing” someone else’s login ID and password is prohibited. Using the provided access for commercial purposes, such as hosting your own business website, is not allowed. Sending out unsolicited email to a large group of people is prohibited. Also as with codes of ethics, violations of these policies have various consequences. In most cases, such as with Wi-Fi, violating the acceptable use policy will mean that you will lose your access to the resource. While losing access to Wi-Fi at Starbucks may not have a lasting impact, a university student getting banned from the university’s Wi-Fi (or possibly all network resources) could have a large impact. One of the domains that have been deeply impacted by digital technologies is the domain of intellectual property. Digital technologies have driven a rise in new intellectual property claims and made it much more difficult to defend intellectual property. Intellectual property is defined as “property (as an idea, invention, or process) that derives from the work of the mind or intellect.” This could include creations such as song lyrics, a computer program, a new type of toaster, or even a sculpture. Practically speaking, it is very difficult to protect an idea. Instead, intellectual property laws are written to protect the tangible results of an idea. In other words, just coming up with a song in your head is not protected, but if you write it down it can be protected. Congress shall have the power . . . To promote the Progress of Science and useful Arts, by securing for limited Times to Authors and Inventors the exclusive Right to their respective Writings and Discoveries. An important point to note here is the “limited time” qualification. While protecting intellectual property is important because of the incentives it provides, it is also necessary to limit the amount of benefit that can be received and allow the results of ideas to become part of the public domain. Outside of the US, intellectual property protections vary. You can find out more about a specific country’s intellectual property laws by visiting the World Intellectual Property Organization. In the following sections we will review three of the best-known intellectual property protections: copyright, patent, and trademark. Who can make copies of the work. Who can make derivative works from the original work. Who can perform the work publicly. Who can display the work publicly. Who can distribute the work. Many times, a work is not owned by an individual but is instead owned by a publisher with whom the original author has an agreement. In return for the rights to the work, the publisher will market and distribute the work and then pay the original author a portion of the proceeds. Copyright protection lasts for the life of the original author plus seventy years. In the case of a copyrighted work owned by a publisher or another third party, the protection lasts for ninety-five years from the original creation date. For works created before 1978, the protections vary slightly. You can see the full details on copyright protections by reviewing the Copyright Basics document available at the US Copyright Office’s website. In the United States, a copyright is obtained by the simple act of creating the original work. In other words, when an author writes down that song, makes that film, or designs that program, he or she automatically has the copyright. However, for a work that will be used commercially, it is advisable to register for a copyright with the US Copyright Office. A registered copyright is needed in order to bring legal action against someone who has used a work without permission. So, in our examples, the copyright owner has no recourse if the collector destroys her artwork. But the collector does not have the right to make copies of the artwork. Another important provision within copyright law is that of fair use. Fair use is a limitation on copyright law that allows for the use of protected works without prior authorization in specific cases. For example, if a teacher wanted to discuss a current event in her class, she could pass out copies of a copyrighted news story to her students without first getting permission. Fair use is also what allows a student to quote a small portion of a copyrighted work in a research paper. If you are ever considering using a copyrighted work as part of something you are creating, you may be able to do so under fair use. However, it is always best to check with the copyright owner to be sure you are staying within your rights and not infringing upon theirs. As noted above, current copyright law grants copyright protection for seventy years after the author’s death, or ninety-five years from the date of creation for a work created for hire. But it was not always this way. The first US copyright law, which only protected books, maps, and charts, provided protection for only 14 years with a renewable term of 14 years. Over time, copyright law was revised to grant protections to other forms of creative expression, such as photography and motion pictures. Congress also saw fit to extend the length of the protections, as shown in the chart below. Today, copyright has become big business, with many businesses relying on the income from copyright-protected works for their income. Many now think that the protections last too long. The Sonny Bono Copyright Term Extension Act has been nicknamed the “Mickey Mouse Protection Act,” as it was enacted just in time to protect the copyright on the Walt Disney Company’s Mickey Mouse character. Because of this term extension, many works from the 1920s and 1930s that would have been available now in the public domain are not available. As digital technologies have changed what it means to create, copy, and distribute media, a policy vacuum has been created. In 1998, the US Congress passed the Digital Millennium Copyright Act (DMCA), which extended copyright law to take into consideration digital technologies. Two of the best-known provisions from the DMCA are the anti-circumvention provision and the “safe harbor” provision. The anti-circumvention provision makes it illegal to create technology to circumvent technology that has been put in place to protect a copyrighted work. This provision includes not just the creation of the technology but also the publishing of information that describes how to do it. While this provision does allow for some exceptions, it has become quite controversial and has led to a movement to have it modified. The “safe harbor” provision limits the liability of online service providers when someone using their services commits copyright infringement. This is the provision that allows YouTube, for example, not to be held liable when someone posts a clip from a copyrighted movie. The provision does require the online service provider to take action when they are notified of the violation (a “takedown” notice). For an example of how takedown works, here’s how YouTube handles these requests: YouTube Copyright Infringement Notification. Yet the DMCA has become a serious threat that jeopardizes fair use, impedes competition and innovation, chills free expression and scientific research, and interferes with computer intrusion laws. If you circumvent DRM [digital rights management] locks for non-infringing fair uses or create the tools to do so you might be on the receiving end of a lawsuit. In chapter 2, we learned about open-source software. Open-source software has few or no copyright restrictions; the creators of the software publish their code and make their software available for others to use and distribute for free. This is great for software, but what about other forms of copyrighted works? If an artist or writer wants to make their works available, how can they go about doing so while still protecting the integrity of their work? Creative Commons is the solution to this problem. Creative Commons is a nonprofit organization that provides legal tools for artists and authors. The tools offered make it simple to license artistic or literary work for others to use or distribute in a manner consistent with the author’s intentions. Creative Commons licenses are indicated with the symbol . It is important to note that Creative Commons and public domain are not the same. When something is in the public domain, it has absolutely no restrictions on its use or distribution. Works whose copyrights have expired, for example, are in the public domain. CC-BY: This is the least restrictive license. It lets others distribute and build upon the work, even commercially, as long as they give the author credit for the original work. CC-BY-SA: This license restricts the distribution of the work via the “share-alike” clause. This means that others can freely distribute and build upon the work, but they must give credit to the original author and they must share using the same Creative Commons license. CC-BY-NC-ND: This license is the same as CC-BY-NC but also adds the ND restriction, which means that no derivative works may be made from the original. These are a few of the more common licenses that can be created using the tools that Creative Commons makes available. For a full listing of the licenses and to learn much more about Creative Commons, visit their web site. As with copyright, patent protection lasts for a limited period of time before the invention or process enters the public domain. In the US, a patent lasts twenty years. This is why generic drugs are available to replace brand-name drugs after twenty years. It must be original. The invention being submitted must not have been submitted before. It must be non-obvious. You cannot patent something that anyone could think of. For example, you could not put a pencil on a chair and try to get a patent for a pencil-holding chair. It must be useful. The invention being submitted must serve some purpose or have some use that would be desired. The job of the patent office is to review patent applications to ensure that the item being submitted meets these requirements. This is not an easy job: in 2012, the US Patent Office received 576,763 patent applications and granted 276,788 patents. The current backlog for a patent approval is 18.1 months. Over the past fifty years, the number of patent applications has risen from just 100,000 a year to almost 600,000; digital technologies are driving much of this innovation. Sidebar: What Is a Patent Troll? The advent of digital technologies has led to a large increase in patent filings and therefore a large number of patents being granted. Once a patent is granted, it is up to the owner of the patent to enforce it; if someone is found to be using the invention without permission, the patent holder has the right to sue to force that person to stop and to collect damages. 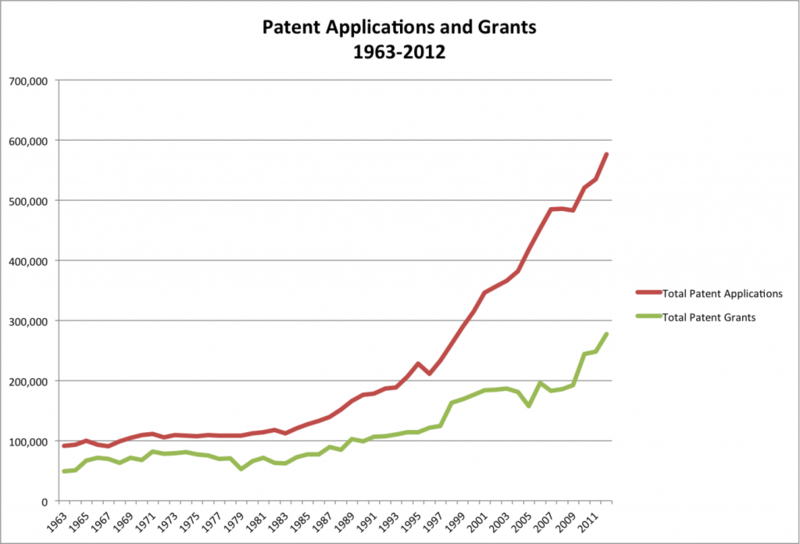 The rise in patents has led to a new form of profiteering called patent trolling. A patent troll is a person or organization who gains the rights to a patent but does not actually make the invention that the patent protects. Instead, the patent troll searches for those who are illegally using the invention in some way and sues them. In many cases, the infringement being alleged is questionable at best. For example, companies have been sued for using Wi-Fi or for scanning documents, technologies that have been on the market for many years. Recently, the US government has begun taking action against patent trolls. Several pieces of legislation are working their way through Congress that will, if enacted, limit the ability of patent trolls to threaten innovation. You can learn a lot more about patent trolls by listening to a detailed investigation conducted by the radio program This American Life, by clicking this link. A trademark is a word, phrase, logo, shape or sound that identifies a source of goods or services. For example, the Nike “Swoosh,” the Facebook “f”, and Apple’s apple (with a bite taken out of it) are all trademarked. The concept behind trademarks is to protect the consumer. Imagine going to the local shopping center to purchase a specific item from a specific store and finding that there are several stores all with the same name! Two types of trademarks exist – a common-law trademark and a registered trademark. As with copyright, an organization will automatically receive a trademark if a word, phrase, or logo is being used in the normal course of business (subject to some restrictions, discussed below). A common-law trademark is designated by placing “TM” next to the trademark. A registered trademark is one that has been examined, approved, and registered with the trademark office, such as the Patent and Trademark Office in the US. A registered trademark has the circle-R (®) placed next to the trademark. The trademark is likely to cause confusion with a mark in a registration or prior application. The trademark is merely descriptive for the goods/services. For example, trying to register the trademark “blue” for a blue product you are selling will not pass muster. The trademark is a geographic term. The trademark is ornamental as applied to the goods. For example, a repeating flower pattern that is a design on a plate cannot be trademarked. As long as an organization uses its trademark and defends it against infringement, the protection afforded by it does not expire. Because of this, many organizations defend their trademark against other companies whose branding even only slightly copies their trademark. For example, Chick-fil-A has trademarked the phrase “Eat Mor Chikin” and has vigorously defended it against a small business using the slogan “Eat More Kale.” Coca-Cola has trademarked the contour shape of its bottle and will bring legal action against any company using a bottle design similar to theirs. As an example of trademarks that have been diluted and have now lost their protection in the US are “aspirin” (originally trademarked by Bayer), “escalator” (originally trademarked by Otis), and “yo-yo” (originally trademarked by Duncan). The rise of information systems has forced us to rethink how we deal with intellectual property. From the increase in patent applications swamping the government’s patent office to the new laws that must be put in place to enforce copyright protection, digital technologies have impacted our behavior. The term privacy has many definitions, but for our purposes, privacy will mean the ability to control information about oneself. Our ability to maintain our privacy has eroded substantially in the past decades, due to information systems. Organizations that collect PII are responsible to protect it. The Department of Commerce recommends that “organizations minimize the use, collection, and retention of PII to what is strictly necessary to accomplish their business purpose and mission.” They go on to state that “the likelihood of harm caused by a breach involving PII is greatly reduced if an organization minimizes the amount of PII it uses, collects, and stores.” Organizations that do not protect PII can face penalties, lawsuits, and loss of business. In the US, most states now have laws in place requiring organizations that have had security breaches related to PII to notify potential victims, as does the European Union. While the privacy laws in the US seek to balance consumer protection with promoting commerce, in the European Union privacy is considered a fundamental right that outweighs the interests of commerce. This has led to much stricter privacy protection in the EU, but also makes commerce more difficult between the US and the EU. Digital technologies have given us many new capabilities that simplify and expedite the collection of personal information. Every time we come into contact with digital technologies, information about us is being made available. From our location to our web-surfing habits, our criminal record to our credit report, we are constantly being monitored. This information can then be aggregated to create profiles of each and every one of us. While much of the information collected was available in the past, collecting it and combining it took time and effort. Today, detailed information about us is available for purchase from different companies. 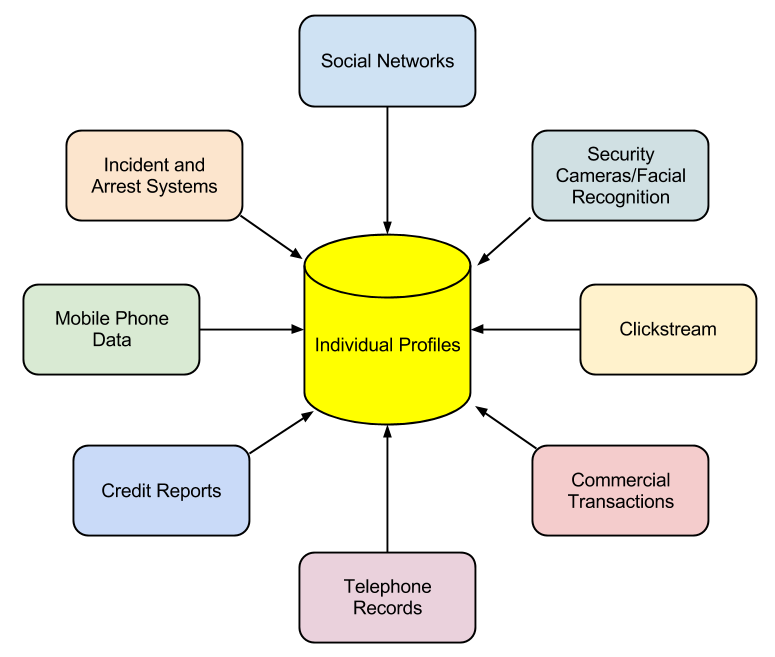 Even information not categorized as PII can be aggregated in such a way that an individual can be identified. This process of collecting large quantities of a variety of information and then combining it to create profiles of individuals is known as non-obvious relationship awareness, or NORA. First commercialized by big casinos looking to find cheaters, NORA is used by both government agencies and private organizations, and it is big business. In some settings, NORA can bring many benefits, such as in law enforcement. By being able to identify potential criminals more quickly, crimes can be solved more quickly or even prevented before they happen. But these advantages come at a price: our privacy. In the US, the government has strict guidelines on how much information can be collected about its citizens. Certain classes of information have been restricted by laws over time, and the advent of digital tools has made these restrictions more important than ever. Websites that are collecting information from children under the age of thirteen are required to comply with the Children’s Online Privacy Protection Act (COPPA), which is enforced by the Federal Trade Commission (FTC). To comply with COPPA, organizations must make a good-faith effort to determine the age of those accessing their websites and, if users are under thirteen years old, must obtain parental consent before collecting any information. The Family Educational Rights and Privacy Act (FERPA) is a US law that protects the privacy of student education records. In brief, this law specifies that parents have a right to their child’s educational information until the child reaches either the age of eighteen or begins attending school beyond the high school level. At that point, control of the information is given to the child. While this law is not specifically about the digital collection of information on the Internet, the educational institutions that are collecting student information are at a higher risk for disclosing it improperly because of digital technologies. The Health Insurance Portability and Accountability Act of 1996 (HIPAA) is the law the specifically singles out records related to health care as a special class of personally identifiable information. This law gives patients specific rights to control their medical records, requires health care providers and others who maintain this information to get specific permission in order to share it, and imposes penalties on the institutions that breach this trust. Since much of this information is now shared via electronic medical records, the protection of those systems becomes paramount. When it comes to getting permission to share personal information, the US and the EU have different approaches. In the US, the “opt-out” model is prevalent; in this model, the default agreement is that you have agreed to share your information with the organization and must explicitly tell them that you do not want your information shared. There are no laws prohibiting the sharing of your data (beyond some specific categories of data, such as medical records). In the European Union, the “opt-in” model is required to be the default. In this case, you must give your explicit permission before an organization can share your information. Do Not Track is a technology and policy proposal that enables users to opt out of tracking by websites they do not visit, including analytics services, advertising networks, and social platforms. At present few of these third parties offer a reliable tracking opt out, and tools for blocking them are neither user-friendly nor comprehensive. Much like the popular Do Not Call registry, Do Not Track provides users with a single, simple, persistent choice to opt out of third-party web tracking. The rapid changes in information technology in the past few decades have brought a broad array of new capabilities and powers to governments, organizations, and individuals alike. These new capabilities have required thoughtful analysis and the creation of new norms, regulations, and laws. In this chapter, we have seen how the areas of intellectual property and privacy have been affected by these new capabilities and how the regulatory environment has been changed to address them. What does the term information systems ethics mean? What is a code of ethics? What is one advantage and one disadvantage of a code of ethics? What does the term intellectual property mean? Give an example. What protections are provided by a copyright? How do you obtain one? What protections are provided by a patent? How do you obtain one? What does a trademark protect? How do you obtain one? What does the term personally identifiable information mean? What protections are provided by HIPAA, COPPA, and FERPA? How would you explain the concept of NORA? Provide one example of how information technology has created an ethical dilemma that would not have existed before the advent of information technology. Find an example of a code of ethics or acceptable use policy related to information technology and highlight five points that you think are important. Do some original research on the effort to combat patent trolls. Write a two-page paper that discusses this legislation. Give an example of how NORA could be used to identify an individual. How are intellectual property protections different across the world? Pick two countries and do some original research, then compare the patent and copyright protections offered in those countries to those in the US. Write a two- to three-page paper describing the differences. Information Systems for Business and Beyond by David T. Bourgeois is licensed under a Creative Commons Attribution 4.0 International License, except where otherwise noted.